In September, The Egypt Social Progress Indicators (ESPI), a project co-developed by CESR with partners in Egypt, released its list of scored indicators for labor rights, working conditions and wage trends in the country. The ESPI findings, which measure progress against benchmarks informed by national and international human rights standards, as well as development commitments, reflect an overall need for broad policy changes to improve socioeconomic wellbeing, working conditions and employment outcomes in Egypt. Youth unemployment in 2016 was found to be alarmingly high, with 26.5% of all young people (aged 15 – 29) unemployed—an especially damning figure given that youth is the largest population group in Egypt. Women’s labor force participation rate was extremely low at only 22.9%, lagging far behind other lower middle income countries. Meanwhile, the gender wage gap indicator shows wider disparity than official estimates suggest. In addition, no progress was shown on the real wage index, as the value of wages declined by 14% between 2016 and 2017, severely weakening the ability of households to meet their basic needs. The analysis also confirmed that lack of regulation is a problem in both the growing private sector and the large informal sector, where workers struggle with unfair dismissals and depreciating wages. Among the principal challenges found to improving working conditions are obstacles to forming trade unions and restrictions on engaging in peaceful strikes as a means of negotiating solutions to inequalities at work. The negative social and economic effects of the decline in real wages make it imperative that the Egyptian government and private sector act to address this trend. This blatant instance of inequality raises questions about just distribution of economic gains, and how well the economy is serving ordinary people. The commentaries that accompany the ESPI indicators find that more progressive labor policies and protections could vastly improve the overall socioeconomic well-being of Egyptians. Countering pressures for austerity policies, especially those that call for reduced public spending to control public debt, and taking action towards providing an adequate minimum wage would certainly help improve people’s living standards. Meanwhile, women in the workplace sorely need more proactive measures against discrimination and structural inequalities, including expanded maternity leave and childcare provisions, particularly in the private sector. 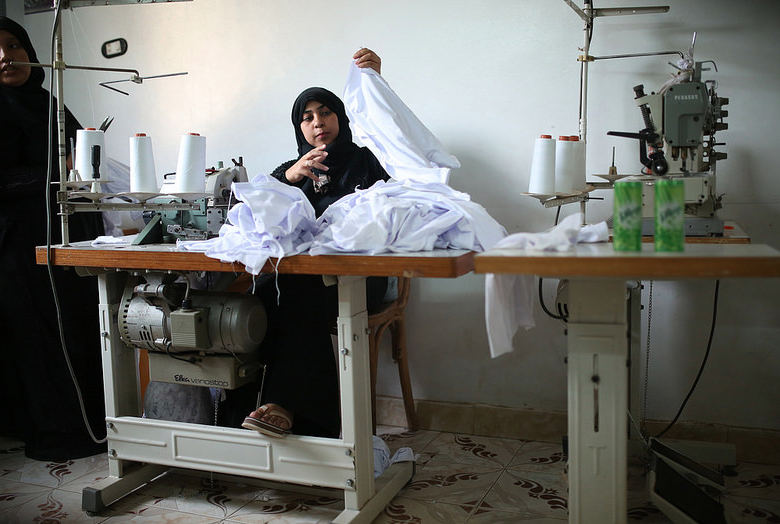 Ensuring full and productive employment and decent work for all is key for eliminating poverty, addressing rising economic inequality and achieving sustainable development (and indeed, is a commitment of the Egyptian government under the Sustainable Development Goals). ESPI’s labor indicators provide important information on labor trends, working conditions and wage policy, as well as the legal and constitutional protections that affect those conditions. They also highlight specific challenges for women in the labor market. The full ESPI metric aims to offer a multidimensional view of the socioeconomic situation in Egypt and its human impacts, also providing scores on health; education; urbanization; food, water, and agricultural land; and economic policy, which was released in June. Scored indicators and in-depth analyses of the other four topics will be released throughout 2018.